Ah … Great Firewall of China – I once again succumb to your pressures! I’m in China (yay!) but I stupidly forgot to set up my VPN before leaving New York and now I’m having oodles of fun trying to set it up in-country. It’ll only be for a bit longer, and even though Gmail lags like no other, at least I still have e-mail. Facebook and WordPress? Not so much. I’m sending this post via e-mail, which is simply cumbersome. This is just a short trip to China so I’ll be back in New York before Independence Day. But hey, it’s 6 in the morning and I’m awake – when’s the last time that happened? Unfortunately the sky is so hazy it’s hard to make out the sun …. I’m no artist. And I can be quite particular and judge-y, so a lot of times when I see contemporary art I’m just like … eh, no. I love contemporary art, but generally more for the intellectual exercise than for its actual aesthetics. But once in a blue moon I’ll see something and it’s so obviously ‘contemporary’ but in a way that I can actually relate to and simply respond. So here are two pieces from MoMA’s contemporary wing that I just adore. “Untitled (Poster Painting)” (2008) by Klara Lidén. I’ve always had a thing for paper. Maybe it’s the architect in me, but I’ve always appreciated the physical texture of paper and its fragility over the sleek unreality of digital or the humdrum tradition of stretched canvas. 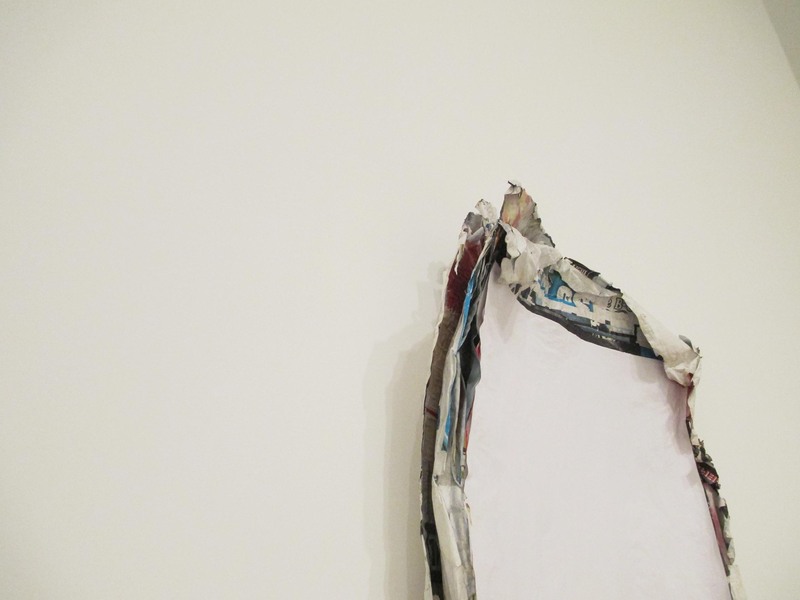 I love this work, the layering of printed paper, torn and imprecise, curling, struggling to free itself from the wall. And yet at its core, blank and undefined. “Play Dead; Real Time” (2003) by Douglas Gordon. This was pretty cool. 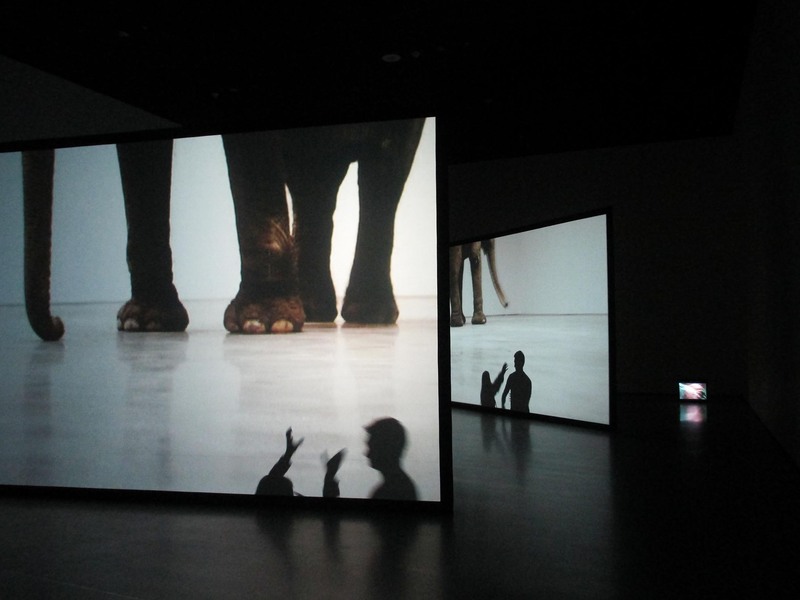 Normally I’m not a big fan of video art because it tends to be very convoluted and requires you to sit on a weird bench and watch, but this piece had you walking around in order to appreciate the scale of it and the effect of light and changing perspective. 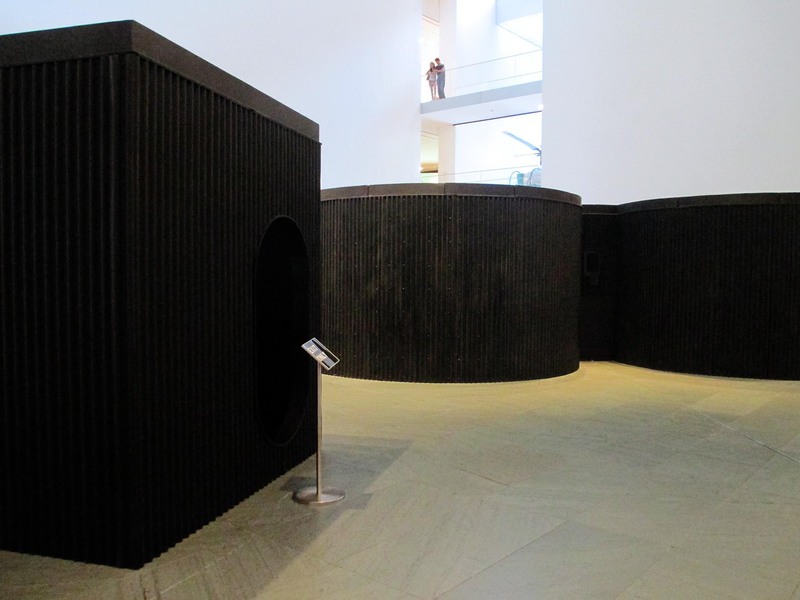 The piece took up the entire room, and there were two large screens which had video projected onto them and a smaller monitor on the floor in the corner. So as you walked around in the darkened space, the larger-than-life elephants lumbered about in their brightly lit flat surfaces … and other people made hand shadows. There’s a lot of food in New York. Thank goodness because I’m not a good cook (although for the sake of cheapness, I try). 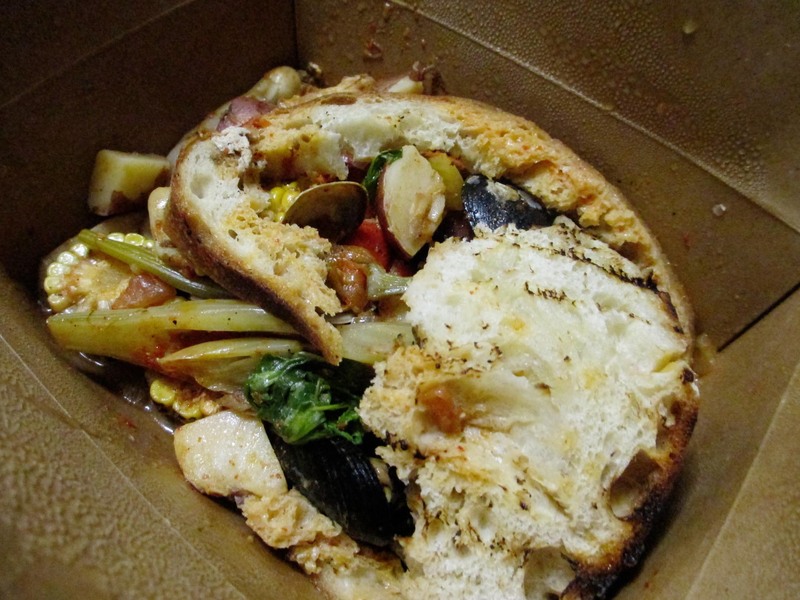 Eating out so often means … yummy midnight leftovers! It also means a very sad bank account … but let’s not think on that, eh? All of these are totally recommended. 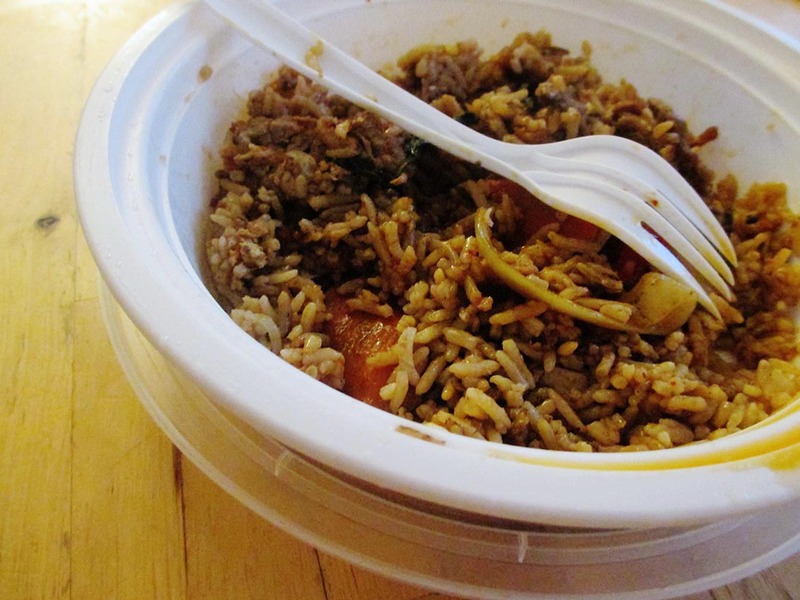 Beyond Thai Kitchen’s drunken fried rice is really darn good and every time I go to M&O I try a different sandwich and am consistently completely satisfied. 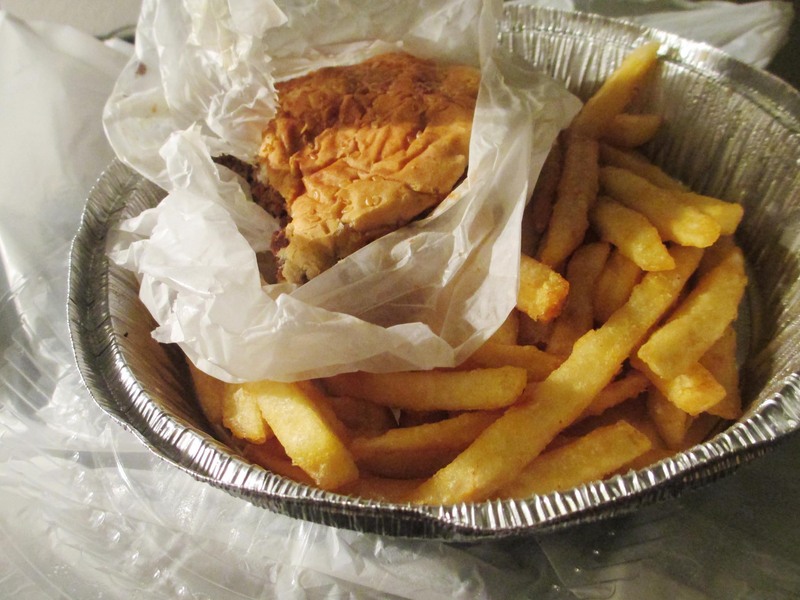 Red Rooster in Harlem on 125th is pricey, but it’s worth the trek and splurge … at least once. 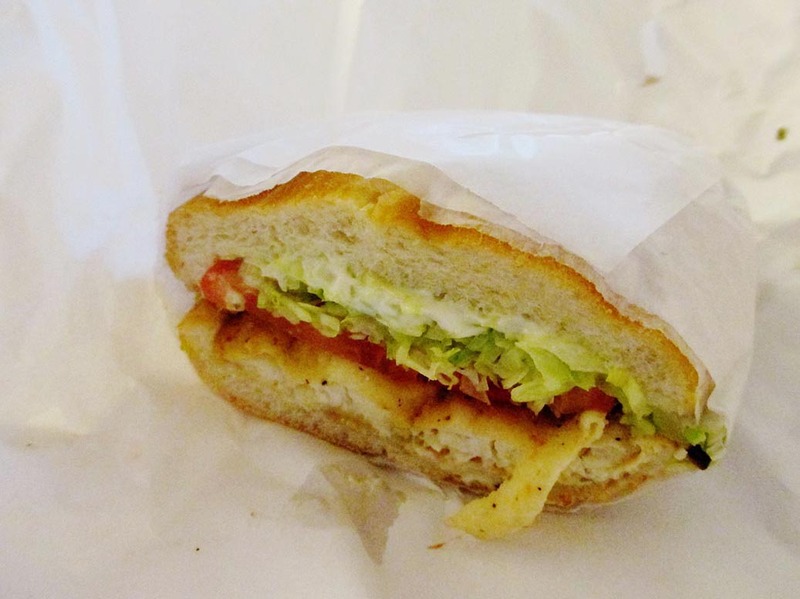 And as for M2M … I can’t even count how many times I’ve been there or how many hamburgers I’ve had from there – I also really don’t think I’d want to know. 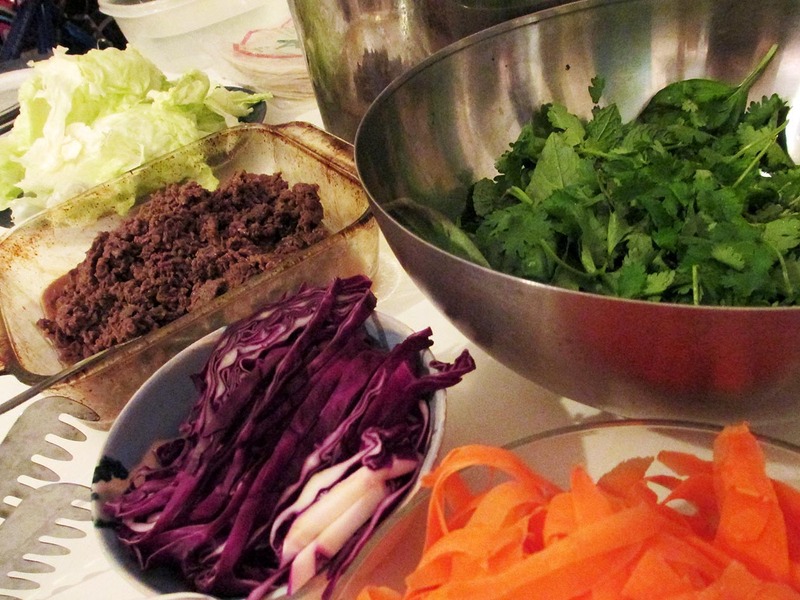 I’ve eaten summer rolls before, but I’d never made them before. Now I’m just like … why the hell have I been spending so much on something so easy to make?!? 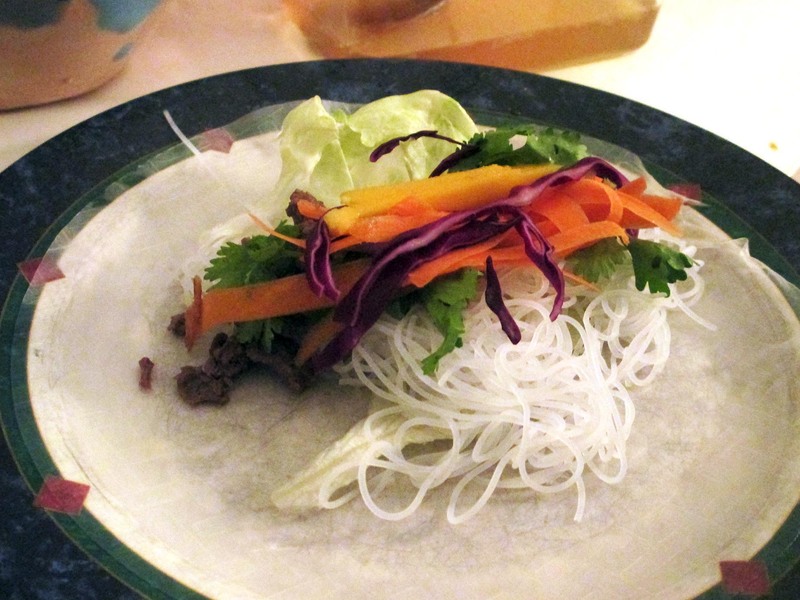 All you need are rice paper wraps, lettuce, beef, red lettuce, cilantro, carrots, (Chinese) vermicelli, and hoisin sauce. Dip rice paper wrap in a bowl of water, pile on ingredients, squirt some sauce on there, wrap it like a burrito (the rice paper even sticks to itself! ), and shove summer roll into mouth. Repeat. The end. Sunday morning I went to campus. Given that I graduated a few weeks ago, I still spend an awful lot of time on campus. I like working there, but I’ve also been planning an upcoming workshop with some other people and it’s easiest for us all to meet on campus. So … I did some work uptown Sunday morning and I was meeting some people downtown Sunday evening, meaning that I had the afternoon to kill and didn’t want to waste it by going all the way home just to come back. Therefore, I did the only logical thing someone in my position would – I went to MoMA. Woot. “Mouse Museum” and “Ray Gun Wing” (1972-1977) by Claes Oldenburg. Going up the main flight of stairs brings you to the open platform where there are these two large black structures (one which is sorta shaped like a mouse head and the other sorta like a ray gun). You step inside and voila … a whole bunch of random crap. I suppose ‘crap’ is too harsh of a word, but it’s a bunch of knick-knacks and tchotchkes and little toys and plastic things and a whole lotta what-nots and doodads and other various found objects. Eh. I liked Oldenburg’s soft sculptures of food on the 6th floor far better than these weird collections. “New Shelton Wet/Dry Doubledecker” (1981) by Jeff Koons. Oh Koons … every time I come to MoMA and see this ‘sculpture’ I can’t help but shake my head. 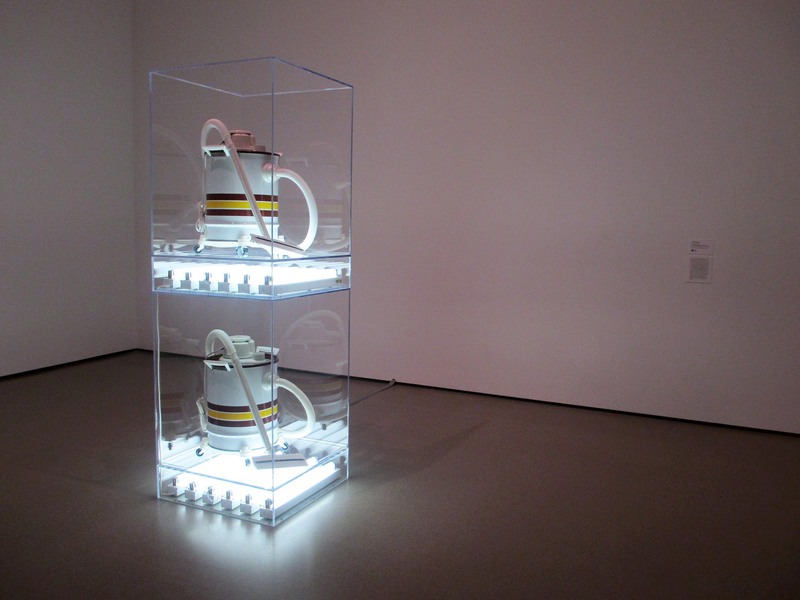 To me, taking two vacuum cleaners, putting them in plexi boxes, and under-lighting them with fluorescents is not art. Apparently MoMA disagrees. “Basic House” (1999) by Martín Ruiz de Azúa. This was actually pretty cool. In the design section tucked away in the corner is this inflatable structure that’s supposed to be used as a homeless shelter. I don’t know about that … it’s more likely to be used by some hipster camping out urban-style than by an actual homeless person (who probably wouldn’t appreciate the attention a giant space age-y bubble would bring), but it’s a cool concept nonetheless. 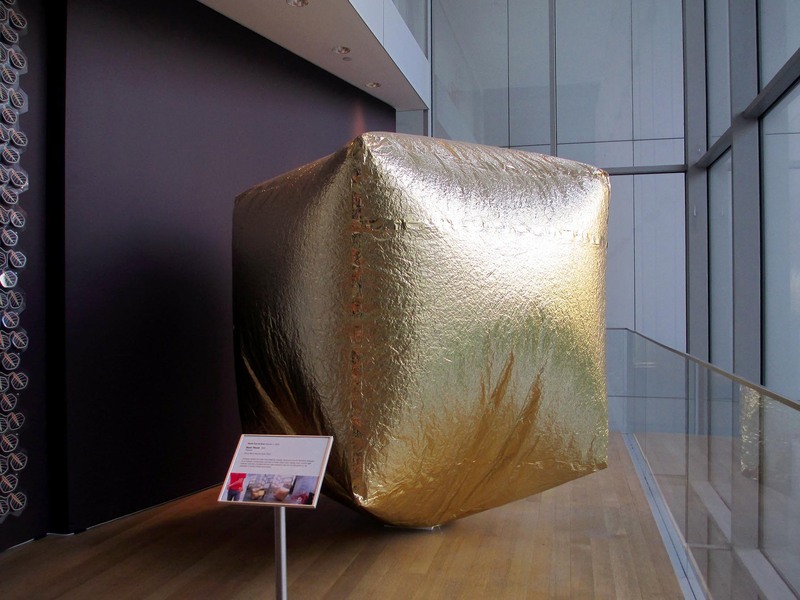 Made out of polyester, it’s an ultra-portable, ultra-lightweight structure that can get blown up by the air from sidewalk grilles and then folded up teeny tiny. And … as I walked down the street after leaving the museum, I noticed a crowd of people near Radio City and a whole lotta cops. What’s going on? 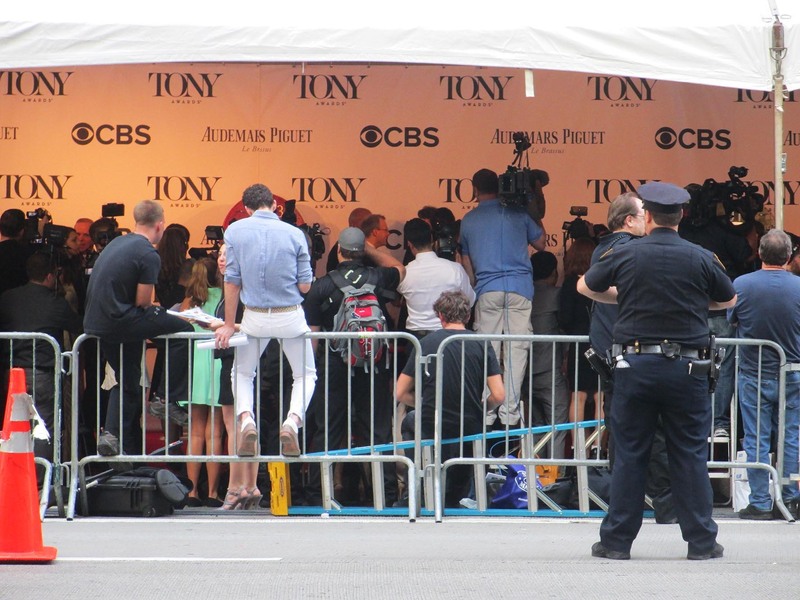 Oh, it’s the Tony Awards. Oh. Okay. Whatever, just another day in New York. Nice way to spend an afternoon especially since I get into MoMA for free – heck yeah! Not sure why I have a Manhattan bus map since I rarely rode the bus in Manhattan. And not sure why I have two different subway maps, 2009 and 2011 (but not the newest, correct 2013 map), but I like how the 2011 design (which I believe is still current) looks much more retro than the older version. Doesn’t really change much anyhow, and with all the construction and redirecting of trains, sometimes the maps themselves aren’t all that helpful and it’s best to keep an eye out for posted signs. 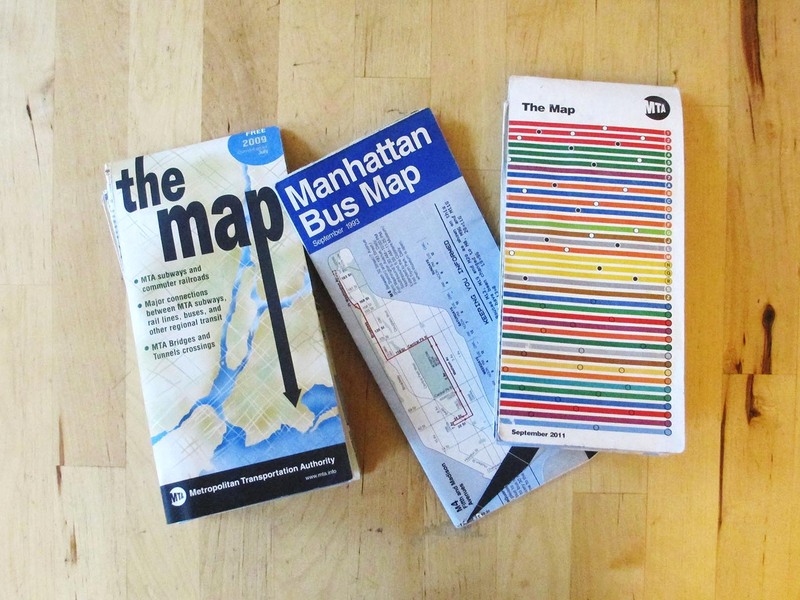 Now where can I get my hands on a physical Queens bus map? Or are these physical maps a thing of the past? Sure I have PDFs of these maps saved on my Kindle … but what if my Kindle dies? For the past two years I have lived in Manhattan. 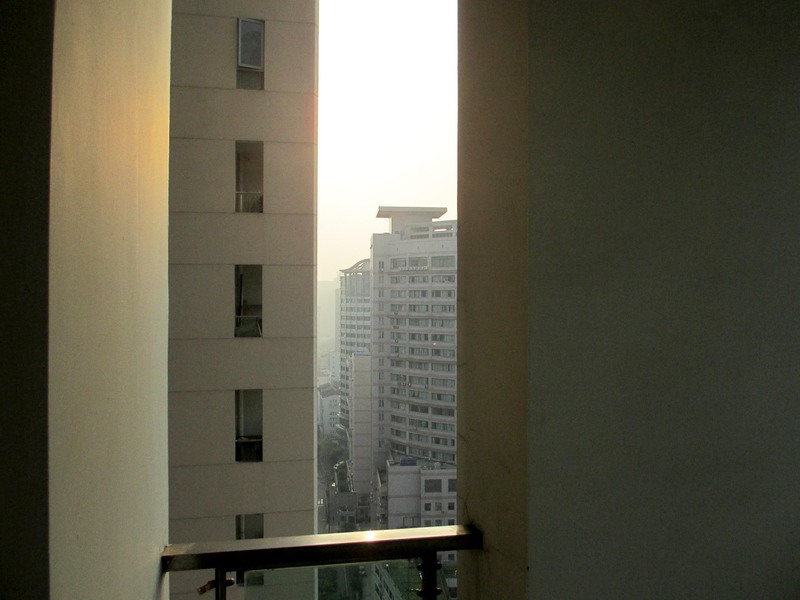 I was in the city, in “New York, New York.” I’m no longer there, and though the rent is much cheaper out in the boroughs, it’s still a bit bittersweet. Upper West Side, Harlem, West Village, SoHo, Chinatown, Chelsea … I’ll miss you. But I’ll be seeing you soon. Well, probably not Harlem. I won’t go back there – long story. 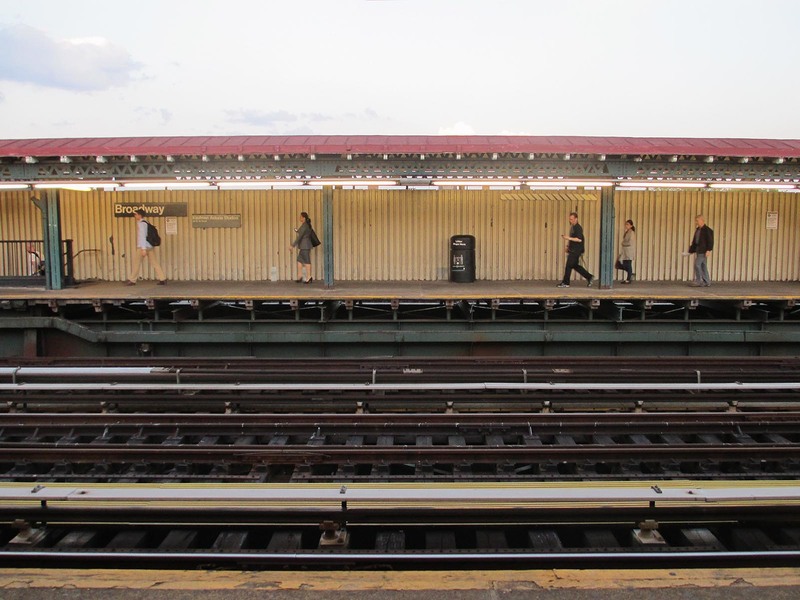 I like this picture, taken at the Broadway Station in Queens, because of its overwhelming horizontality. I rarely used to venture outside of Manhattan and rarely ventured above 125th so it still freaks me out when the subway is above ground (because that completely goes against the “sub-” prefix). I just about got the Manhattan subway map memorized, but now I’m having to learn new stops and door opening sides, new train and bus routes, new street name equivalents and numbering quirks, et cetera. Seriously, Queens is a whole new ballgame.